I have fallen in love with the eight year old version of my husband. This has been a summer of many moves for us. My sister moved. Adam and I moved. Adam's brother moved. And last weekend, Adam's parent's moved. Then, when sorting through a large pile of old school projects, I found his third grade journal. However, third grade was also the year that Adam's family learned they would be moving from Georgia to North Carolina, so there were several entries like this: "I don't want to move! I have to move to North Carolina. I will miss all my friends. I'll have to go to a new school." or "I want my dad. He is up in North Carolina. I miss him." Of course, I saw bits and pieces of the Adam I know and love today, but finding that journal also opened my eyes to parts of Adam that I had never known. An airplane/car/ dinosaur-loving, Power Ranger-watching, lego-playing kid that I completely and utterly adore. I didn't think it was possible to love the current Adam any more than I already do but--as the saying goes--you learn something new everyday. Today's recipe is perfect for summer because it can be ready in less than ten minutes. There's no cooking involved, and considering it's a salad, it requires minimal chopping. I first made a version of this salad four years ago with my cousin when we were visiting my grandparents in Florida. She's a vegetarian and makes protein-filled salads like this frequently. If you've never tried hearts of palm before, I encourage you to try them in this salad. They're a vegetable harvested from the inner core of certain palm trees, and they come canned. Hearts of Palm are very mild in flavor, and honestly, I think I enjoy them most for the texture they brings to a salad. I first ate them on salads in Italy, but I have been buying them here in the U.S. ever since. You can find them on the canned vegetable aisle, and though they may be difficult to spot amongst the cans of green beans, most grocery stores have them. The original version of this salad has canned corn in it as well, but seeing as I've overdone it with fresh corn recently, and seeing as I have a documented problem with avocado, I decided to use that instead. This salad is light, but filling, slightly sweet, but savory, and incidentally--despite being a salad--a great vehicle for dipping tortilla chips. Finally, since I'm talking about discoveries today, I wanted to share a few finds from the web. I'm constantly overwhelmed by the number of beautiful food blogs out there, (You can find the ones I love here.) but this week I discovered some that blew me away. The First Mess may make you question everything about your life. Why don't I live out in the country in Ontario between a peach orchard and a vineyard? Why don't I make and photograph exquisite vegan food and eat only vegetables? The writing on Local Milk is vulnerable and achingly beautiful, especially this post. Be ready to have your life view changed. 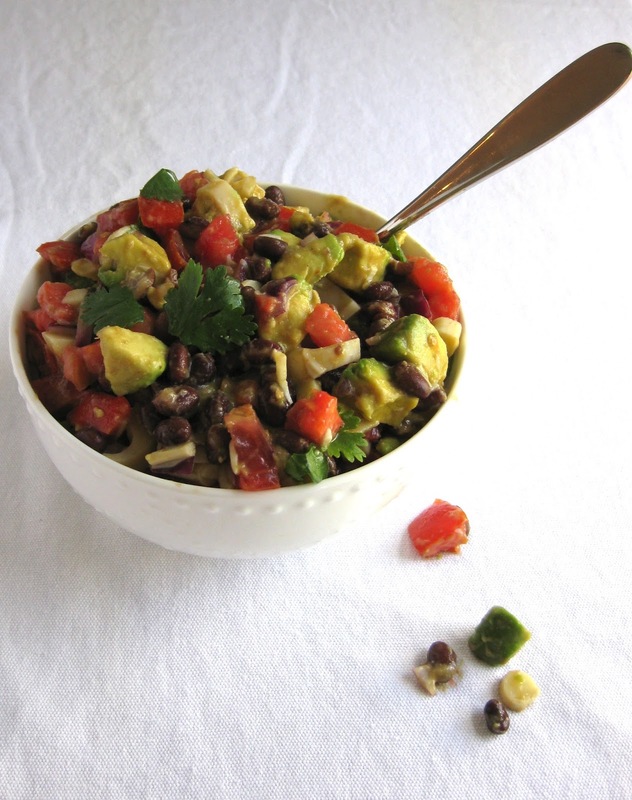 In a medium bowl, mix together black beans, hearts of palm, tomatoes, avocado, onion and cilantro. In a separate, small bowl, whisk together the lemon juice, olive oil, vinegar, and cumin. Pour dressing over salad and toss. Add salt and pepper to your taste. Refrigerate for up to 3 hours. *Some fresh summer corn or a can of mexicorn would be a great addition to this salad. I've been over-doing it on summer corn lately, which is why I did not add it here.